So totally I have done around 220k in 6 months, not a lot I guess. Now I’m using iPod Touch 2G when I walk/run so it’s a lot easier to log distance I did. I experimented recently to upload workout data from another iPod to Nikeplus, that was a bad idea. Data from 2 iPods got merged together and I ended up deleting all my runs at the browser one by one. 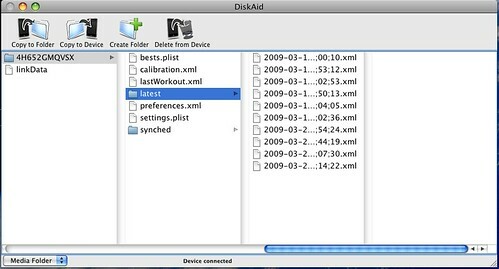 In retrospect I should have just deleted data that isn’t mine but I thought ‘sync’ means that data in my iPod Touch and Nike+’s server will be made the same next time I sync right? I was wrong and this FAQ tells me that after sync files will be moved from the ‘latest’ folder to ‘synched’ folder. To sync again I’ll have to manually move files! Alternatively you could dump Nike+ all together and upload your run data to RunnerPlus. To do that you’ll need Yahoo Widget Engine and their desktop widget. It supports Mac OS X or up to Windows XP only. In my view the graphic isn’t as good as Nike+ but there are other resources which you may find useful. I have tried Bootcamp and dual boot my MacBook with XP. I can’t try running Vista because I have an upgrade version of it. Now with Windows 7 beta available I just tried that again in my MacBook. My Macbook has a new HDD a while ago so I could use it again in the office before it’s forced to retire. Running bootcamp was easy but this time my HDD is too fragmented hence I need to clean it up and restore everything from my Time machine backup. I did this last Sunday making sure I have plenty of time. Time machine restore didn’t fail me and it was done perfectly almost. A minor flaw was the mobile broadband which didn’t work instantly on restore. Found out also that I shouldn’t have expected customer service on a Sunday. Getting Windows 7 to work in the office is a quite easy except that getting anti-virus to work was a bit difficult. I was too greedy to have tried latest AVG Free version 8.5 which turned out to be a problem even at installation, windows gave me a blue screen/memory dump and shutdown. Uninstall didn’t work so I used system restore. I used AVG’s removal tool but still it couldn’t completely get rid of it as I can see resident shield service is still running. At last removal has to be done manually at many places by looking at the removal tool error log. I don’t know why as this article says that AVG free edition should work! I rested for a day yesterday, just can’t wait to go out again this morning. The temperature was just right and morning sun was shinning beautifully through silk like clouds. I walked far this morning to Bowen Road. Bowen Road is a very popular trail for morning walk and run. My intention was to use the milestones there to calibrate my Nike+ iPod gadgets. From my front door to the ‘4000’ milestone in Bowen iPod gave me 2.55km and that took me 24:37 minutes. I then ran and walked 1km between milestones for calibration. The run was OK but after the walk iPod said ‘this workout can’t be used for calibration’, however it showed 1.01km so I guess that was accurate enough. On the return trip iPod gave me 2.59km so the error is around 2% which isn’t too bad.